Through the first couple of years I built up this blog, I regularly received questions from parents out in the world, via email, and I responded as helpfully as I could to each one. Simultaneously, these questions enabled me to see, more clearly, what sorts of issues parents face and I wrote more articles on these topics. Of course, readers are able to comment directly at this blog, below the posts, so a lot of questions have also been posed in this way. (See Top 10 Most-Commented-On Articles at Bilingual Monkeys for the posts with the most questions and other comments.) However, because I came to feel that answering questions via email or at this blog can be helpful to the parents asking the questions, but not necessarily to others if the exchange can’t be easily viewed—and because readers had begun to call for a forum of some type to engage with one another more directly and freely—I opened The Bilingual Zoo community in 2014. The Bilingual Zoo, a free forum that, as of today, has 756 registered members, has far exceeded my hopes as a community where questions can be answered—both by me and by others—and then those responses can be readily seen by the world and serve to help more parents in their own journeys. At the same time, this forum has become a place of warm support and encouragement, where parents, no matter how isolated they might be in their location, no longer need to feel alone in their quest. Currently, The Bilingual Zoo has a total of 837 threads and 5,930 posts. And each month the site receives nearly 100,000 page views. In addition to all the content—and questions answered—at Bilingual Monkeys and The Bilingual Zoo, I also wrote a book, titled Maximize Your Child’s Bilingual Ability: Ideas and inspiration for even greater success and joy raising bilingual kids, where I sought to bring together the best of my experience into a single, empowering form. Since its release in 2016, I’m very gratified to say that this book has been highly praised, around the world, by parents and leaders in the field and has had a positive impact on the success and joy of many families. While I still receive some questions by email, and through my Facebook page—and I do continue to respond to each one personally—it’s also true that I now encourage parents to join me and my fellow “keepers” at The Bilingual Zoo, where questions can be addressed by a broader range of people and where the answers also become more broadly useful for other visitors to the site. Not only will you likely find useful information pertaining to your questions, the value of such searches is that you’ll also come across other content that can be helpful to you as well. Rita Rosenback maintains a very useful site that includes a Q&A Archive with a long list of questions that have been answered by Rita and her team of experienced coaches. Posing your own question can be done by simply sending a message via the Contact page. In addition, Rita has written a book, Bringing Up a Bilingual Child, that I was pleased to recommend. Corey Heller developed this site over a number of years, and though it doesn’t seem to be as active as it once was, it remains a rich resource for information and advice. See my interview with Corey, which took place via email, for a lively, insightful look into her life and work. Chontelle Bonfiglio has created an active site of regular articles that include Expert Advice from language specialists. Chontelle also leads a private Facebook group to discuss issues involving bilingual and multilingual kids. See Chontelle’s popular guest post at this blog. Marianna Du Bosq offers a large number of engaging podcasts with experienced parents and experts, which include a series of Question and Answer episodes. Marianna also runs the Bilingual Avenue Community, a premium support group. Listen to the conversation I had with Marianna in Episode #125, Maximize your child’s bilingual ability. Olena Centeno provides a mix of helpful podcasts and articles on this subject. My work was featured in two podcast episodes, a discussion I had with Olena and her review of my book. Naturally, there are now also a range of Facebook pages and groups on the general subject of raising bilingual and multilingual children or that focus more specifically on supporting a certain target language (like Spanish and the Facebook page Spanglish Baby). I’m afraid I spend very little time on Facebook, so I can’t offer much help when it comes to these pages and groups, but you would be welcome to leave a comment below with your suggestions. And finally, with the rise of Facebook, one of the early forums on raising bilingual and multilingual kids, MultilingualChildren.org, no longer seems to be as active as it once was, but it’s still a useful place of learning and mutual support. How about you? 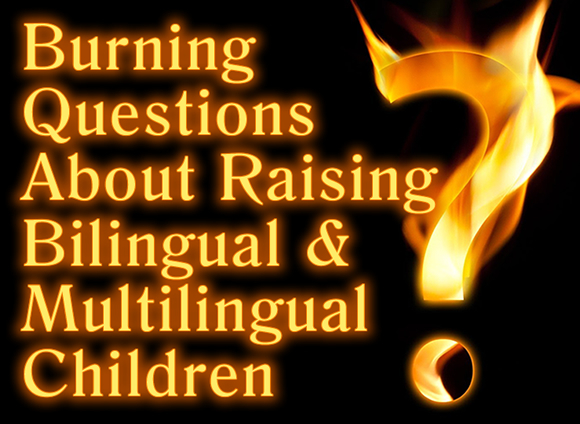 What other resources could you suggest for asking and answering the “burning questions” of the bilingual and multilingual journey? Previous post: Christmas Giveaway at Bilingual Monkeys! Win a Cute Charm with “Bilingual Powers” to Help Empower Your Family’s Journey!